As I mentioned yesterday on Twitter, I’ve been working on compiling a list of the top 10 food items I’ve eaten on my travels. 1. I’m only counting food I’ve eaten at parks I’ve visited. You won’t see any items on this list that I haven’t eaten or sold at parks I haven’t visited. 2. 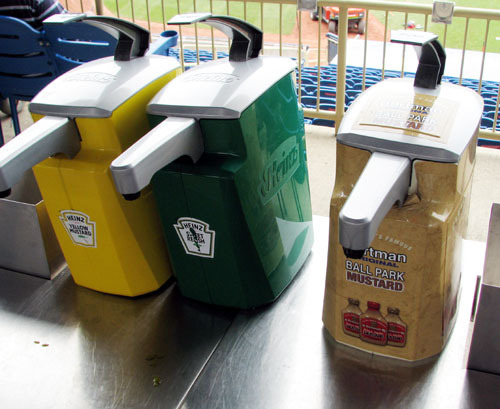 I’m looking at individual food items, rather than a ballpark’s overall selection. You might think you’d need to reach for some Tums after getting through these ample nachos, but they’re not heavy in a bad way. 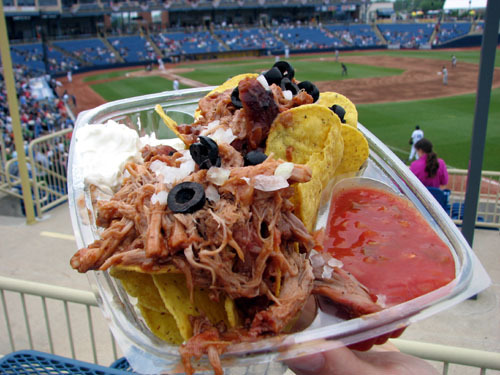 The pulled pork was excellent and better than I’d expect to find at a ballpark. The one knock on these was the server forgot to give me cheese. 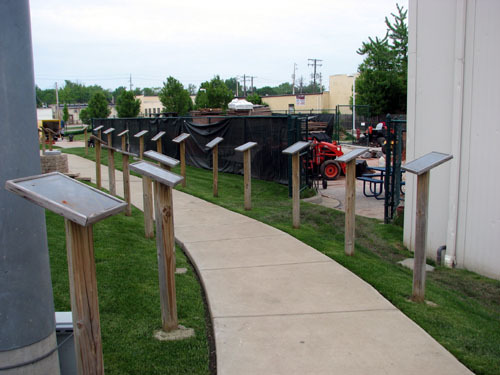 Parkview Field has several apple-themed dishes on its menu, given that Fort Wayne in the place Johnny Appleseed is buried. 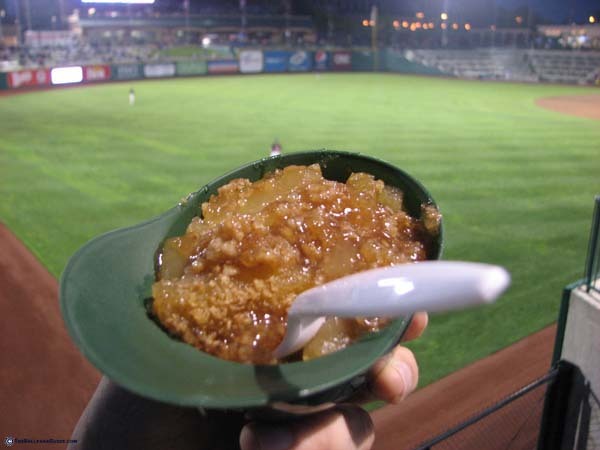 The apple crisp was the best ballpark dessert I’ve ever eaten. (And the ‘Caps helmet it’s served in is a cool bonus.) 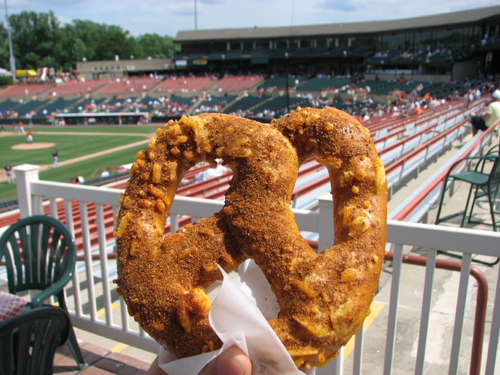 Visit my website to read about all the apple treats and other food items at Parkview Field. 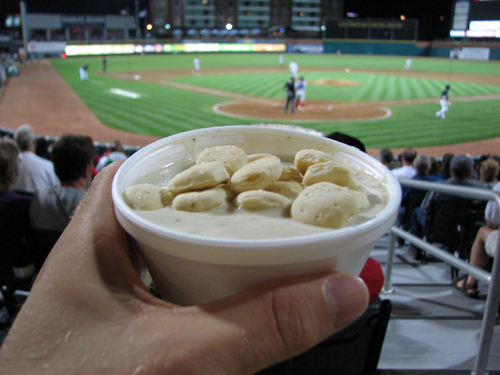 I ate Northeast Delta Dental Stadium’s clam chowder on a July evening last year, and even though it was a hot day, really enjoyed the soup. 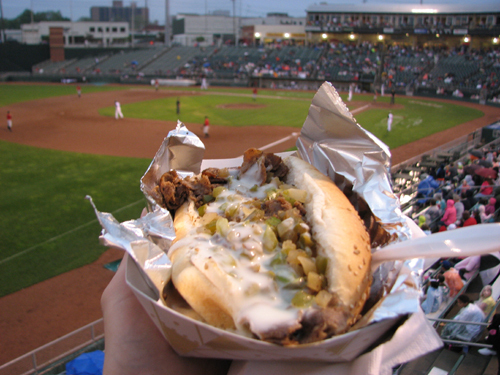 I can see it being the perfect ballpark food on a cold April or September night. The clam chowder isn’t the only seafood item on the menu here. Here’s the full list. I wasn’t a huge fan of the processed cheese goop on the Philly cheesesteak in Lansing, but the bun was fresh, the steak was perfect and the onions and peppers were savory. Crab might as well be the official food of Maryland, and if you’re having crab, you need to season it with Old Bay. This cheese-filled jumbo pretzel was rolled in Old Bay. Dangerously perfect. I tried turkey and pork sammies at Boog’s BBQ in Baltimore, and the turkey one ranked higher in my books. It’s expensive, but you get an ample amount of meat and can also load up on onions, Old Bay, BBQ sauce and horseradish. Quaker Stake & Lube wings are delicious, and surprisingly, the quality doesn’t drop off when served at a stadium. 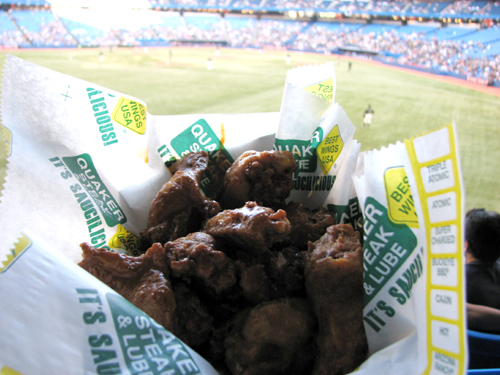 I’ve had several flavors of these wings at Rogers Centre, and they’re all winners in my book. Mac and cheese? Check. Chicken and hot sauce? Check. Blue cheese dressing? Check. Simply the best mac and cheese I’ve ever had anywhere. If you’re in Rochester, don’t pass up a chance to try any of the gourmet mac and cheeses. 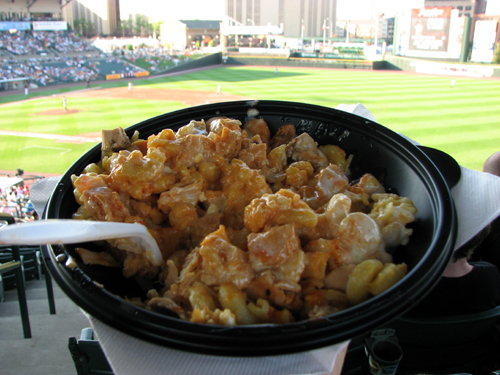 On my website, TheBallparkGuide.com, I’ve got a complete rundown of Frontier Field’s delicious foods. 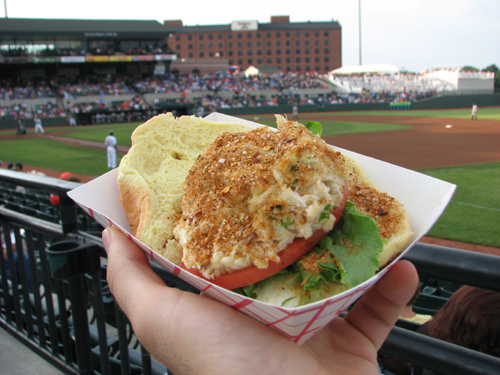 Aberdeen’s menu offers many variations on crab and the crab cake sandwich was killer. 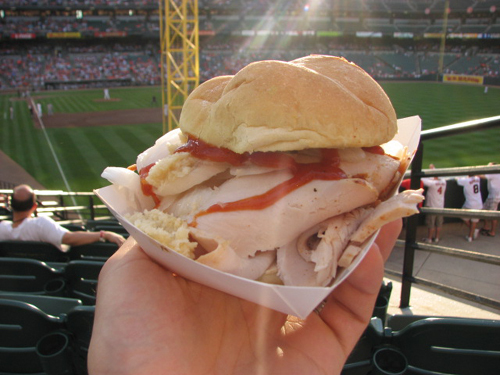 On a fresh bun atop lettuce and tomato, and seasoned with plenty of Old Bay, this is the type of sandwich you could eat every inning. Definitely worth the drive if you’re remotely in the area. 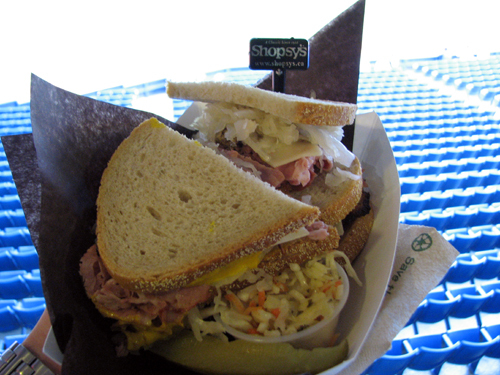 Visit my website for a complete guide to Ripken Stadium’s food selection. I’m curious to hear about the amazing food other people have eaten, and where. I’ll be sure to check it out! As always, follow me on Twitter to read the latest about my website, my blog and my travels. A day after my exciting time in Fort Wayne, I faced another lengthy drive. This time, I’d be driving about four hours east to Cleveland. 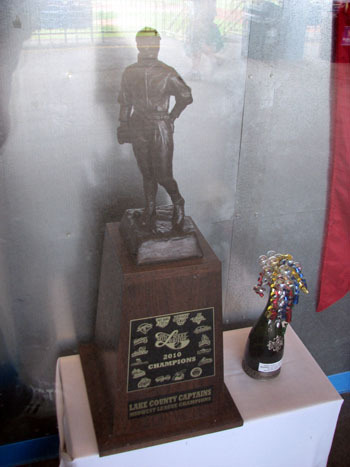 Just to the east of Cleveland is Eastlake, home of the Lake County Captains. 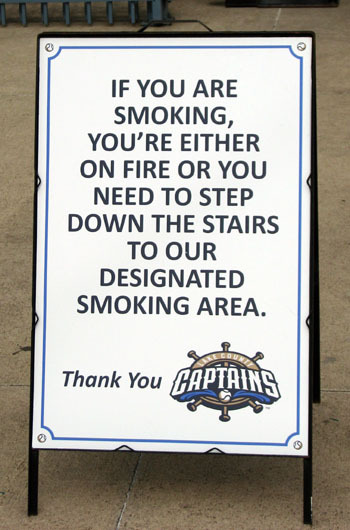 The Captains are another Midwest League team that I could cross off my list on this trip. 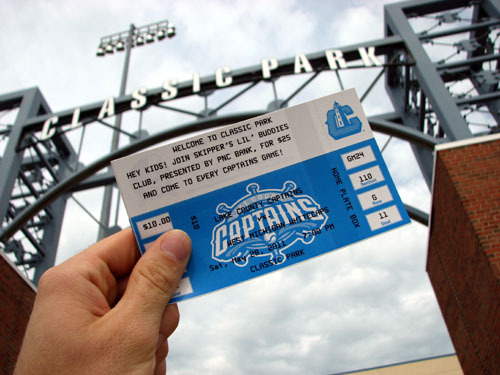 I checked into my hotel about 3 p.m., chilled for a little over an hour and headed to Classic Park, home of the Captains. This is the biggest Minor League Baseball ticket I’ve seen so far. 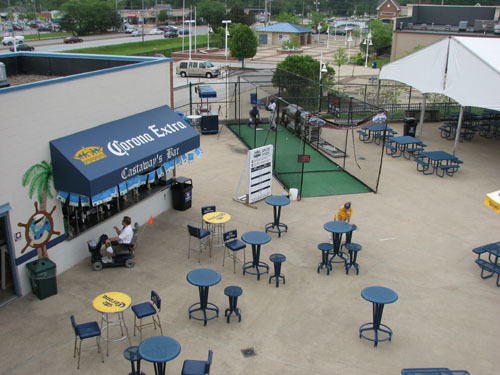 Today’s game was supposed to start at 7 p.m., but because the Captains were making up a previously rained out game against the West Michigan Whitecaps, this would be a doubleheader starting at 6 p.m. Lots of baseball to watch. Upon entry to the ballpark, I took a quick browse through the team store and bought a $10 T-shirt. I was tempted to spend another $15 on a game-used bat (the best price I’ve seen so far), but didn’t bother. 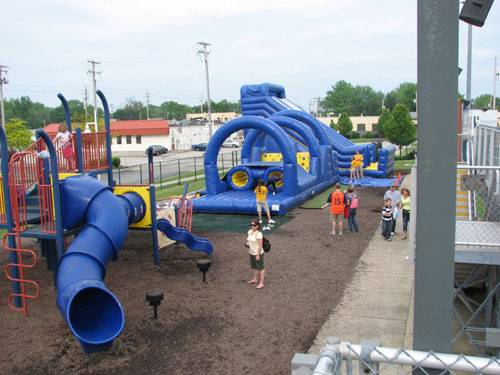 Instead, I donned my new gear and went to the right field corner, where I could see players leaving the clubhouses and heading toward the field. 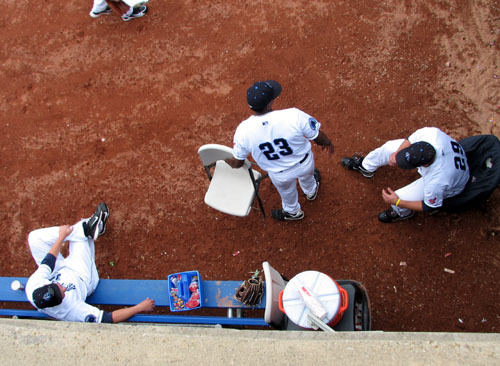 Last summer, I visited Eastwood Field, home of the Mahoning Valley Scrappers. 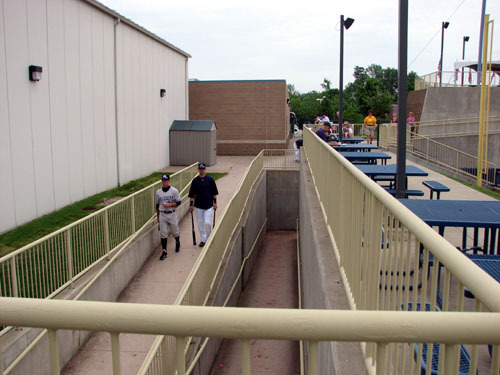 One of this stadium’s best features (for autograph seekers, anyway) is the conjoined clubhouses. If you want to get signatures from both teams, you don’t have to run back and forth — you simply wait outside the clubhouses and get the guys to sign as they come by. 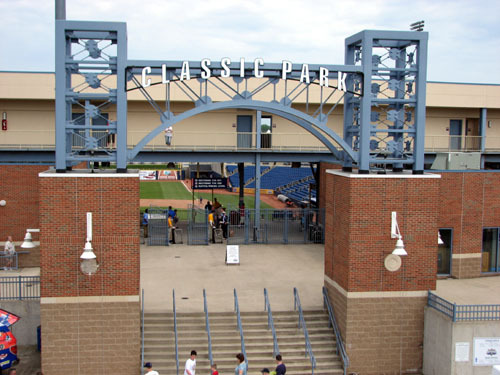 Well, the same is true for Classic Park. There are plenty of opportunities to catch guys for autographs along the route. My guess was that with a doubleheader scheduled, many people would arrive later, and that’s exactly what happened. I wasn’t able to see who’s represented on those plaques, but the Captains’ notable alumni include CC Sabathia, Fausto Carmona, Victor Martinez and Kevin Kouzmanoff. 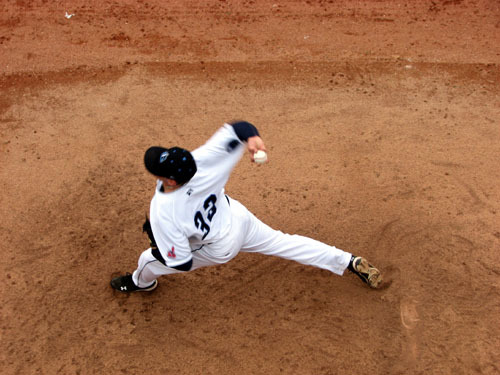 I love sitting behind home plate, as you get a really accurate appreciate of the movement on pitchers’ pitches. Even at the Single-A level, these guys bring it. I ate my nachos from a picnic area down the first base side, which was free of crowding and had a great view. 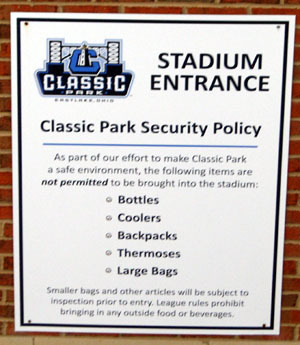 Most ballparks allow backpacks, but Classic Park seems to have an anti-backpack policy. I had mine on, but didn’t get stopped, so I’m not sure what the deal is. I watched the first part of Game 2 from the left field bleachers, then toured the ballpark a bit more before departing a little early, as I was exhausted. One stop left on my first trip — Jerry Uht Park, home of the AA Erie SeaWolves. As I write this, I’m still debating going to Syracuse in the morning for the Chiefs game against Rochester at 2 p.m. It’s a big driving commitment, but I’m anxious to get one game under my belt in 2011. 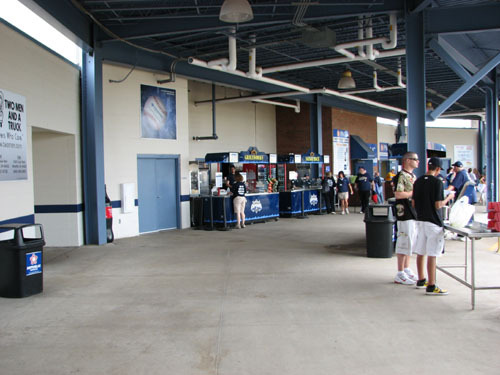 Plus, as you may have read here, I’d like to get a bit more information about Alliance Bank Stadium before I write its official guide for my website, TheBallparkGuide.com. But, whether I go to Syracuse tomorrow or not, I’ve got my first major baseball roadtrip planned. – I’m going to three Jays games in this roadtrip because they’re my favorite team. I’m pumped to see three different opponents in Toronto in these three games. 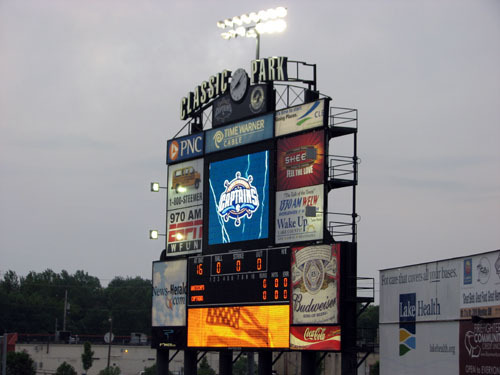 – I’m ultra excited to watch the Lansing Lugnuts, the A affiliate of the Jays. One of my favorite (and Canadian!) prospects, Marcus Knecht, is ripping it up for Lansing this season. As you may have read, I met him and got his autograph last summer in Auburn. The Lugnuts are giving away bobbleheads at this game, too. The player’s identity is a mystery, but given that it’ll probably be a current Jay, I’m excited. – I don’t know much about the Great Lakes Loons, which are the A affiliate of the Dodgers. But they play at a ballpark called Dow Diamond, which looks neat in photos I’ve seen. They’re also in northern Michigan, which is new territory to explore. 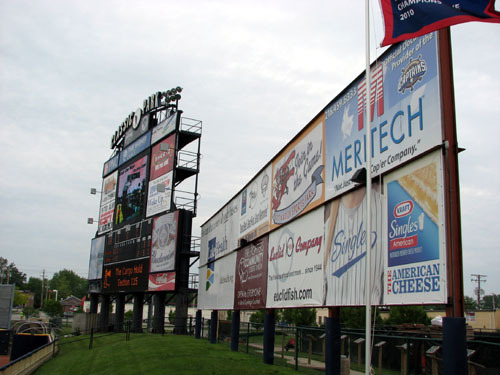 – I’ve seen the West Michigan Whitecaps profiled on a couple different food-related shows and websites, thanks to their gigantic Fifth Third Burger. It’s ridiculous. Will I try to eat it? You’ll just have to keep reading the blog to find out. – I love Detroit. I’ve only been there once, but I liked what I saw of the city. I’m stoked to visit Comerica Park, one of the most beautiful MLB stadiums in my opinion. I’m also staying at the Greektown Casino, which looks amazing and is just a short walk from the ballpark. 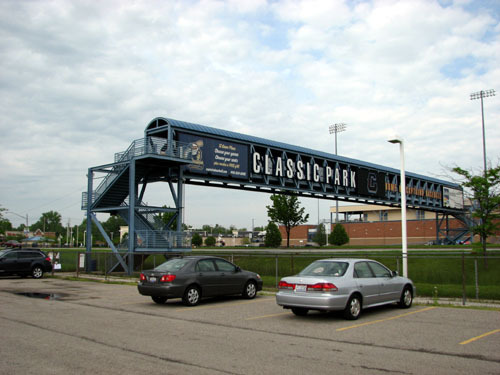 – Toledo has one of the best parks in all the Minor Leagues, so I’m anxious to check it out. 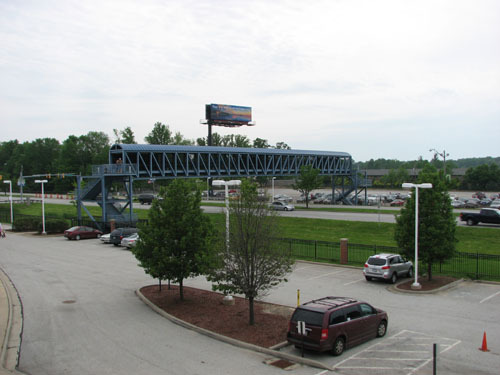 – Fort Wayne is the farthest I’ll visit for a ball game this season … as far as I’ve planned so far, anyway. 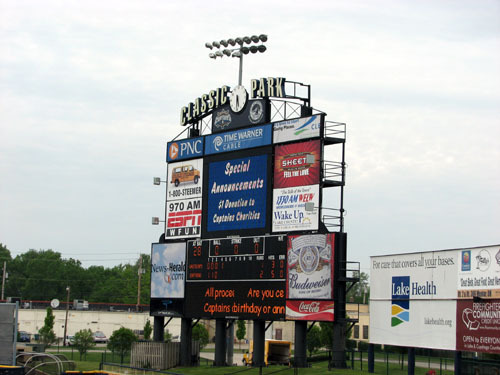 The TinCaps play at Parkview Field, which was build in 2009, making it one of the newest parks in the Minors. 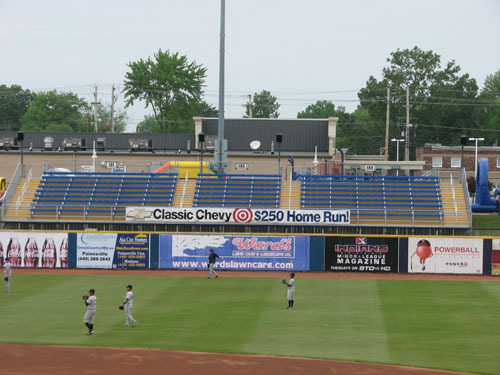 – The day after the game in Fort Wayne, I’ve got a pretty long drive all the way to just east of Cleveland, to watch the Lake County Captains. 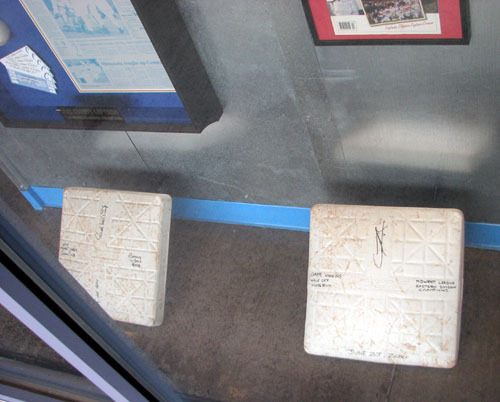 I’m also thinking about some sort of keepsake to get at each new stadium. 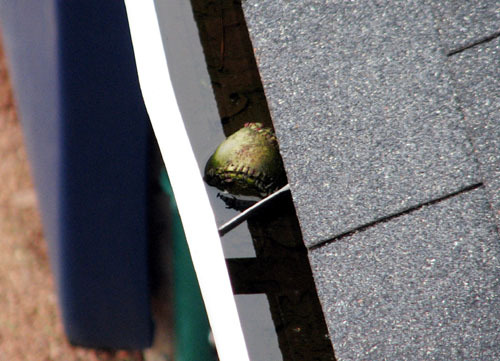 A cap? A T-shirt? I’d love to get caps from each stadium I visit, but I’ve already got enough hats I don’t wear. Any good ideas what I should get from every new ballpark?